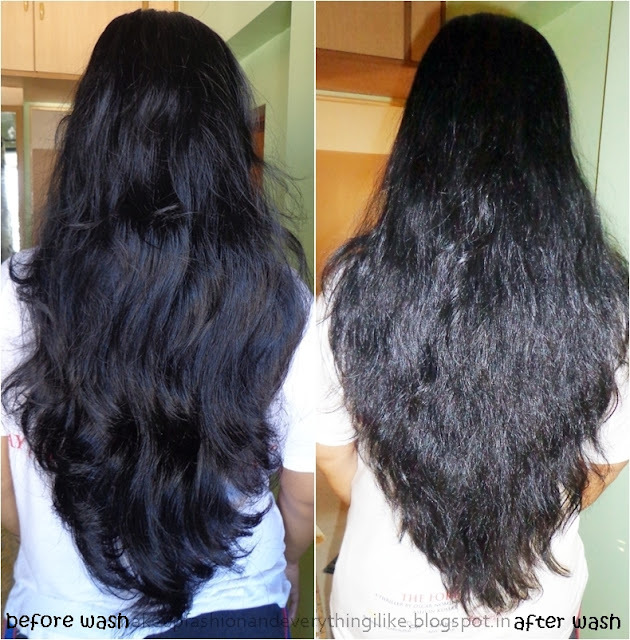 make up fashion & everything i like...: Sunsilk Perfect Straight Shampoo and Conditioner- Review, Before & After Photos! Sunsilk recently launched Perfect Straight Shampoo and Conditioner. & Im here with the review! Unlike other shampoos I was really excited to try this. Anything that takes the frizz away from my hairwill definitely used by me! Sunsilk Perfect Straight Shampoo and Conditioner is co-created by Yoko Yamashita. This shampoo is a pale pearly lavender color & smells fruity. The consistency is a little runny. The conditioner is a white thick creamy conditioner. Both the products comes in a flip cap purple bottles. The shampoo lathers really well. It leaves the hair super clean. The conditioner does a great job too! I kept it for 5mins. It makes the hair really soft. Just after washing it off I felt a whole lot of difference in my hair. I could run my hands thru my hair without much tangle. Here is the Before & After wash picture. On the left you can see may 3rd day hair. How it is wavy & has curly ends. & the after wash picture, I air dried my hair. See how the ends are not curly, the mid area is also very straight. My hair usually doesn't dries this straight, it becomes fluffy & more wavy, but this shampoo did make a difference. I always use a hair serum to tame my hair & make it tangle free, but in this case I skipped the serum. Verdict: If you have frizzy prone hair like I do! Do give it a try. You will definitely like it. I have never used a shampoo that takes out the frizz for real & makes it quiet straight! Straight- not as flat ironed straight (ofcourse no shampoo can do that) but it does makes it manageably straight! Products sent by PR for consideration. Id need that makes my hair curly... more perfect curls which dont break.. any suggestion? do you need a shampoo for curly hair? Hey you got beautiful hair yar. You know for the past one year my hair has become shapeless at the ends and looks like brush bristles.do you know any Remedy? oh is it? try 100% argan oil mid way to the ends everytime u come it.. it should help you. Mine are straight the first day after shampoo then gets wavy. have u tried this shampoo yet? hey thanks swati! yes urs is very straight! Wow ! leave the review yaar,let me see your hair first ...so long and b-e-a-u-t-i-f-u-l..........i am speechless...which oil you use rimmi? such a lovely hair you have ! hehehe! thank u sooo much toa! i use olive & castor oil.